The current theme with television series these days is they are either pointless, mind-numbing, IQ lowering reality shows, or big cable network sponsored in-depth series. I’m glad that it seems the sweeping series are becoming more the norm. Robert Kirkman, creator of The Walking Dead is adding to his stable of excellent tv offerings with Outcast. No, this isn’t going to be about a leper that is ostracized from the community, or even more zombies that are a threat to the brain functioning population. This time we step into the world of exorcisms. Cinemax has won the battle of the networks for Outcast. 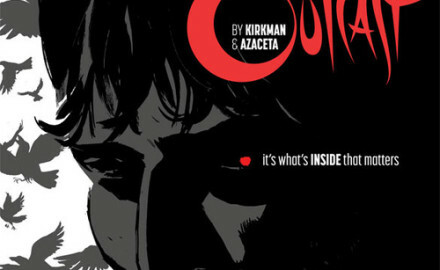 Outcast will be a drama based on Kirkman’s upcoming comic of the same name. The comic and upcoming show centers on Kyle Barnes, dude’s been possessed since he was a kid. As an adult, he wants some answers, but of course the answers could change the state of life on Earth. We can look for the comic in 2014. The Walking Dead is cable’s biggest scripted drama and has already received a season-five renewal. “Despite the success of The Walking Dead, Outcast is only my second foray into the horror genre. I think Kyle Barnes is every bit as compelling as Rick Grimes and demonic possession is way scarier than zombies — so this is going to be fun,” Kirkman said. “Starting a new project is like setting off on an long journey and I couldn’t ask for better travel companions than David Alpert and Sharon Tal Yguado and I’m thrilled to be a part of what Cinemax has planned for the next few years. I don’t see how he can keep the two projects separate in his head, but Kirkman seems to have no trouble keeping them clearly apart from one another. As far as Cinemax goes, Outcast will release as HBO continues to build it’s original scripted features. In addition to the second season of Banshee and the fourth and final season of Strike Back, (This one I’m definitely going to miss), The Knick, a Clive Owen original drama is set for 2014. Thank God for original story lines. I’m just hoping if a show is uber successful, they don’t just continue to slap different names to the characters, put them in a different location and call it ‘Original’. This entry was posted on Tuesday, November 12th, 2013 at 12:18 am	and is filed under Comics, News, Television. You can follow any responses to this entry through the RSS 2.0 feed. You can skip to the end and leave a response. Pinging is currently not allowed. « Jason Statham Is Taking On ‘Layer Cake’ Sequel! !